From the co-author of How Full is Your Bucket? For Kids, the book that started a conversation about the importance of positive interactions in schools and homes around the world, comes a timeless story about how to be healthy and create energy in our daily lives. Through a series of brief adventures, Poppy and Simon discover what it takes to recharge themselves and bring an entire village back to life. 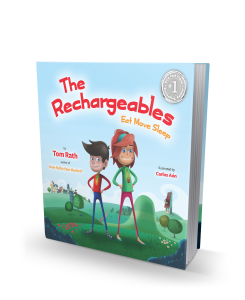 Based on the research and concepts in Eat Move Sleep, Tom Rath’s latest New York Times bestseller, The Rechargeables is about the way small choices have a profound impact on the quality of each day. Eat right, move more, and sleep well for energy. Download these discussion cards to use with kids at home and in the classroom. Download these extended classroom activities based around the book. Complete your own Eat Move Sleep plan based on the nonfiction book. Explore the 400+ resources from the nonfiction book.